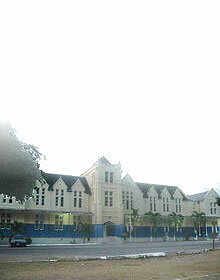 Court Houses were erected in the major towns of each parish across the island. Some structures housed a police station or vestries/parish council offices on the lower level of the building. Some prominent Jamaicans were tried at these locations, namely two of our National Heroes, George William Gordon at the Morant Bay Court House and Sir Alexander Bustamante at the Port Maria Court House. Fort Haldane - This fort was erected in 1759. Named after General George Haldane, Governor of Jamaica. Fort Nugent - All that remains of Fort Nugent is the Martello Tower which was built probably in 1806. 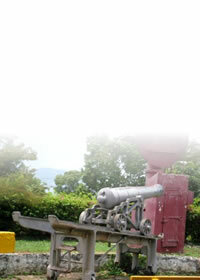 Fort Oracabessa - This fort, situated in Oracabessa in the parish of St. Mary, was built during the War of Trade. Fort Small - Fort Small was built in 1782 to protect the bay between Port Henderson and the Hellshire Hills. Port Royal Forts - This Fort was destroyed in the earthquake of 1692. 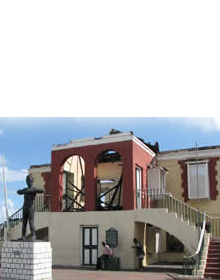 St. Ann's Bay Fort - Located in St. Ann's Bay in St. Ann, the St. Ann's Bay Fort was erected about 1750.